I am so excited to share this recipe with you today because it combines two things I love baking and an amazing charity Cookies for Kids’ Cancer. 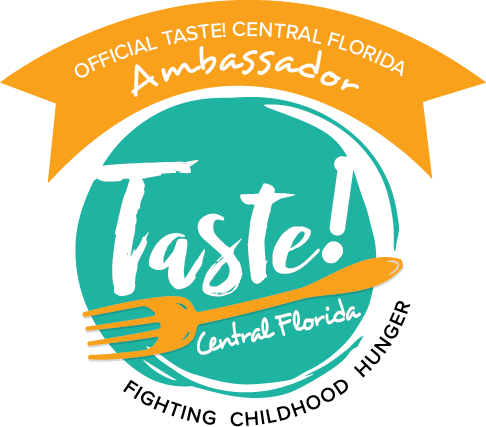 I have been involved with yearly baking campaigns for this charity for the past 3 years. 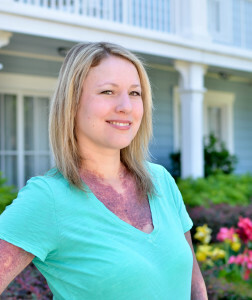 They were founded by two OXOnians who were inspired by their son Liam’s battle with cancer. 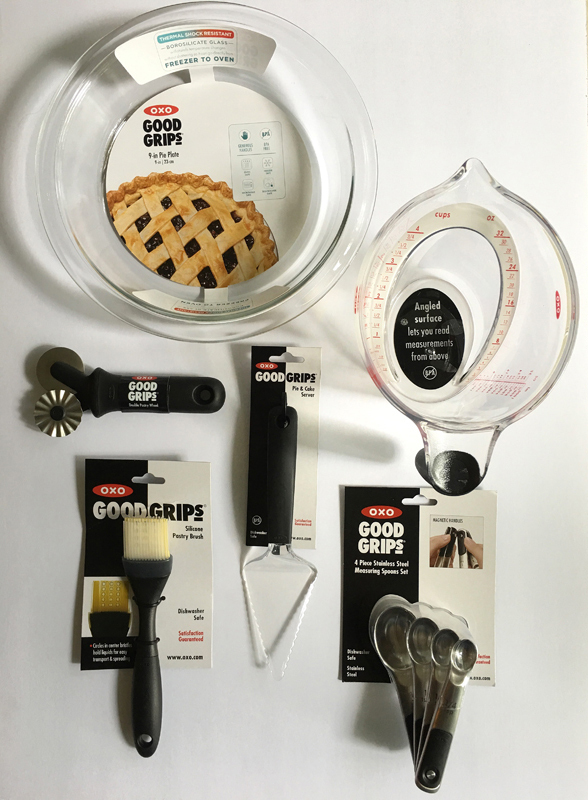 OXO every year will donate up to $100,000 to support Cookies for Kids’ Cancer and as part of this campaign I was a selected blogger to receive this awesome baking set to make sweet treats to share with you. 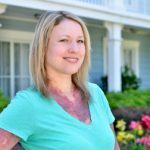 For writing this post OXO will be donating $100 to Cookies for Kids’ Cancer. How great is that!? 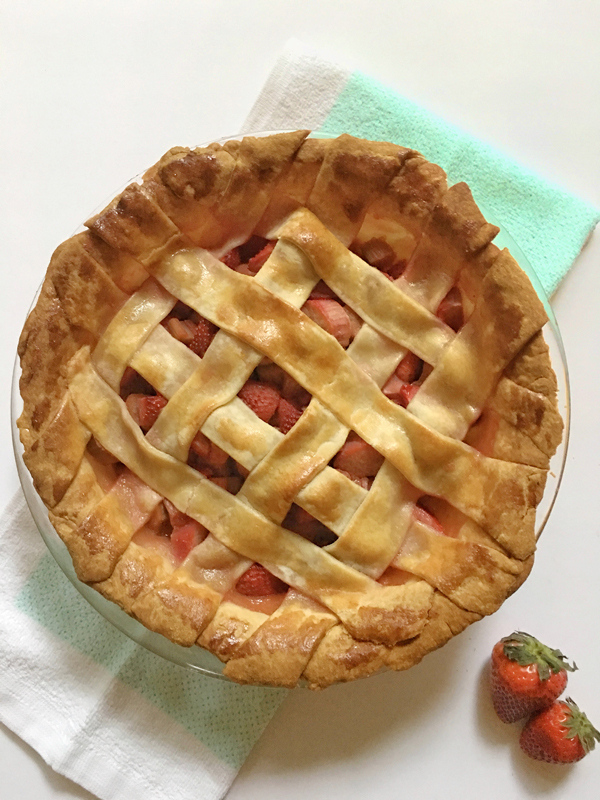 I made a Rustic Strawberry Rhubarb Pie and with this wondrous pie set it was so fun to make! 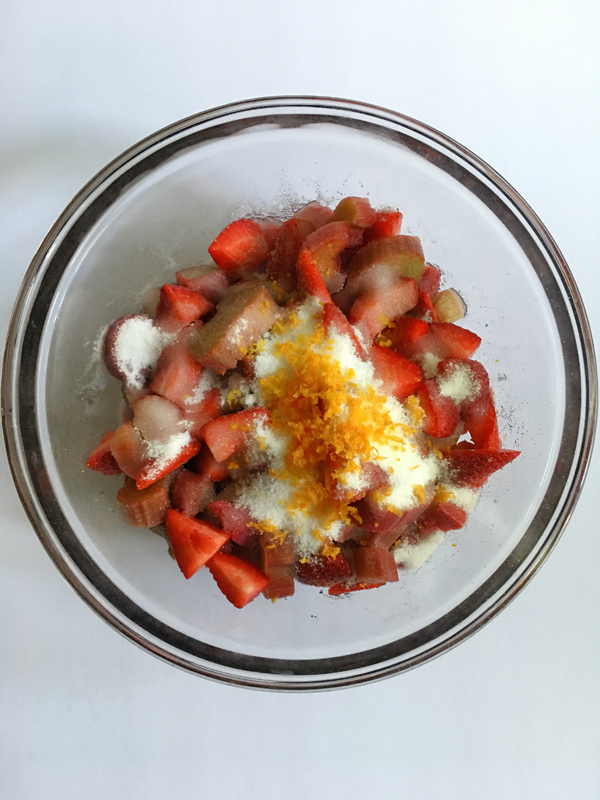 For the Strawberry Rhubarb Pie filling, in a medium bowl toss the chopped strawberries, rhubarb, both sugars, cornstarch, salt and orange zest and juice. Lightly toss together until the cornstarch has mixed well. Set aside the mixture for 10 minutes. 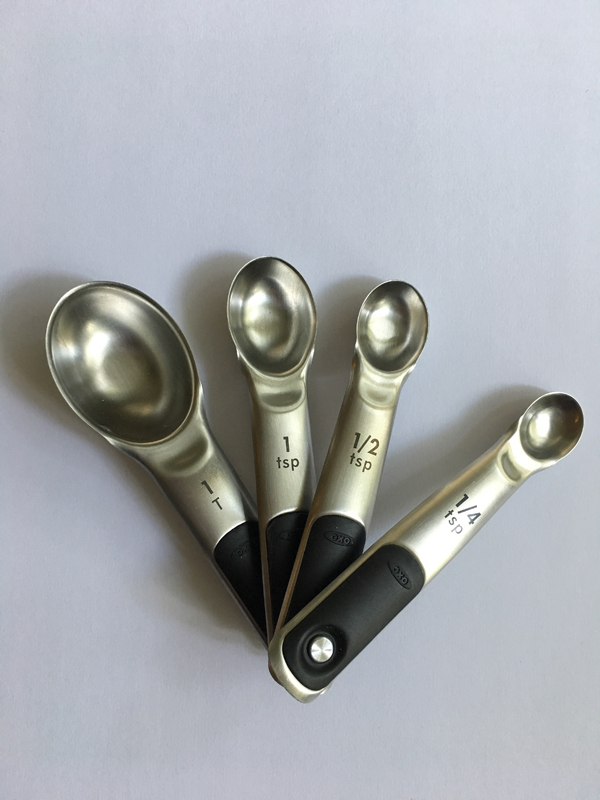 These Stainless Steel Measuring Spoons have an unique magnetic feature that keeps the spoons neatly stacked together and allows you to easily remove one at a time. I really thought this feature was so futuristic! I hate having to pull my spoons off a ring or if you take them all off the ring it makes a mess in the drawer. I also liked the measurements being etched on the spoons so they are permanent and won’t wash off from frequent use. 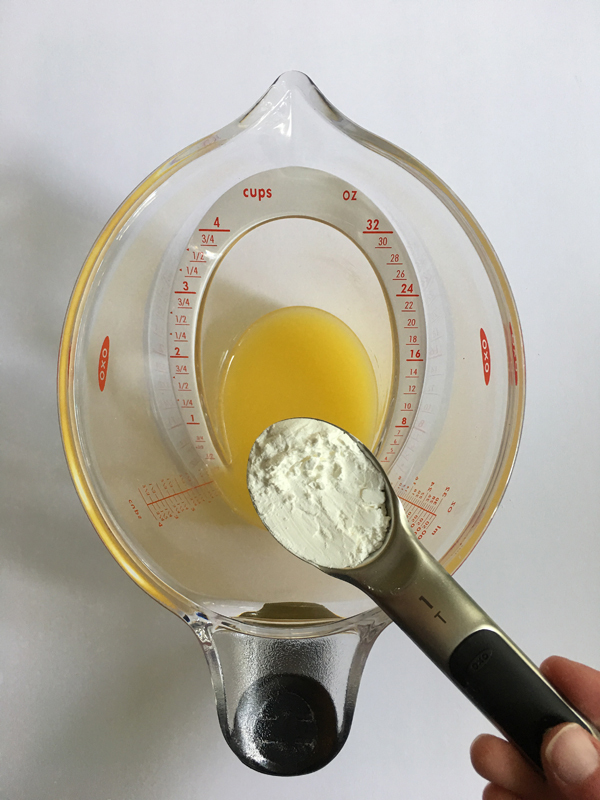 I am in love with this Angled Measuring Cup! I couldn’t believe I was able to pour the liquid into the cup without having to keep stopping and checking from the side if it was an accurate measurement. It was like magic! If you are someone who bakes a lot you NEED this measuring cup. It’s a total game changer. To assemble the pie, place one of the pie crusts into the pie dish. Trim the edges to fit the dish and then spoon in the filling. I used a 9-in pie plate and the rim on the pie plate is larger than ones I have used in the past which made it easier to grab onto the edges for transport from the counter to the oven. For the top crust, place it on a well- floured surface. Slice 8 equal sized strips of dough with a pastry wheel. 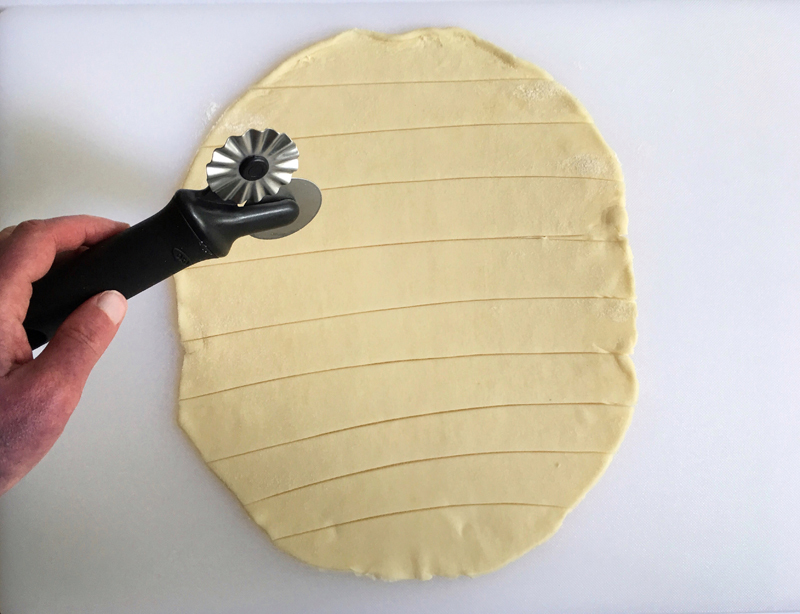 The Double Pastry Wheel made cutting the dough a breeze. Use one side for straight lines and the other for decorative wave ones. It was super sleek and sharp. I can’t wait to try it out again on some pasta dishes. Starting at one side place 5 strips of dough across the pie. Fold back 2 strips that are on either side of the center. Then place 2 strips back over the pie and fold in the 3 other strips half way back and then repeat on opposite side. I would consider looking up a youtube video to get a visual on this since it can be tricky. 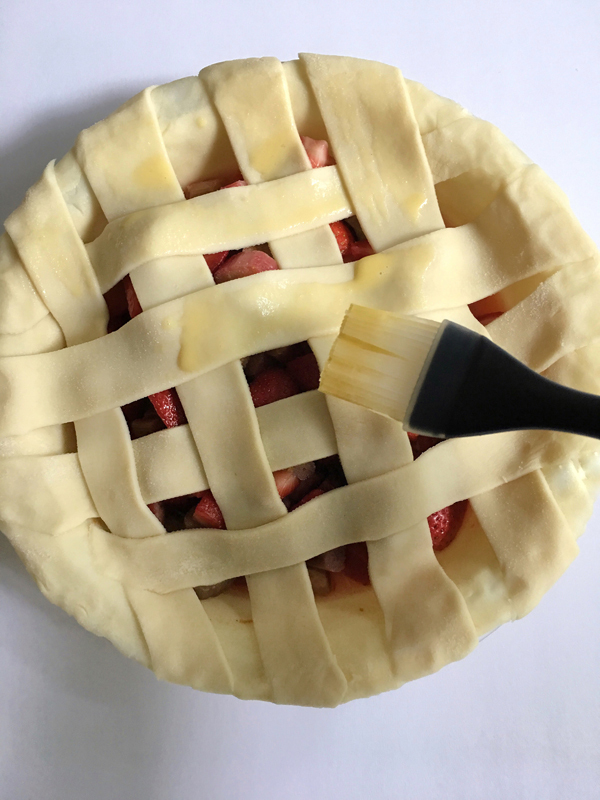 Brush the top of the pie with the egg wash using a Silicone Pastry Brush. I was really happy that this pastry brush has a gap in the center bristles that hold liquid into the brush to prevent from leaking all over the place. It was nice not having to dip the brush back into the egg wash as often and it was super easy to clean. Bake in the oven for 45 minutes and Voilà! 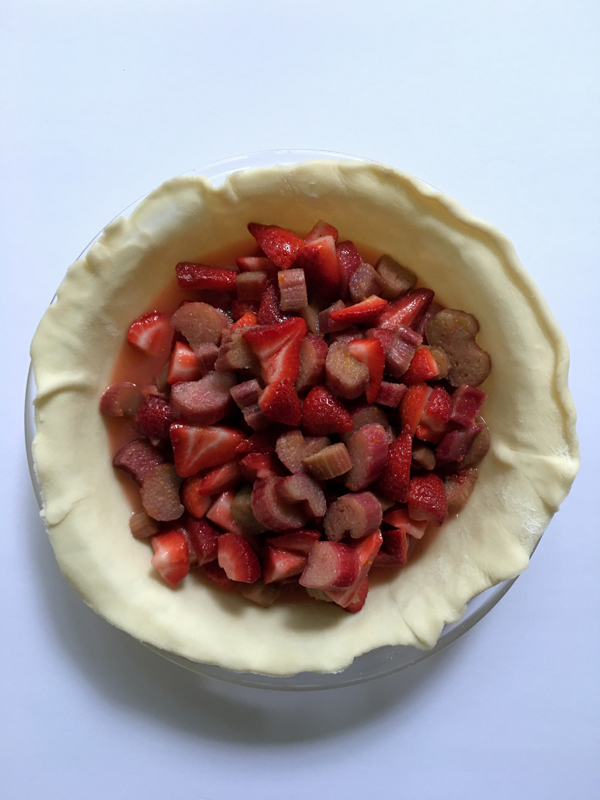 For the pie filling, in a medium bowl toss the chopped strawberries, rhubarb, both sugars, cornstarch, salt and orange zest and juice. Lightly toss together until the cornstarch has mixed well. Set aside the mixture for 10 minutes. To assemble the pie, place one of the pie crusts into the pie dish. Trim the edges to fit the dish. For the top crust, place it on a well- floured surface. Slice 8 equal sized strips of dough with a pastry cutter. Starting at one side place 5 strips of dough across the pie. Fold back 2 strips that are on either side of the center. Then place 2 strips back over the pie and fold in the 3 other strips half way back and then repeat on opposite side. I would consider looking up a youtube video to get a visual on this since it can be tricky. Brush the top of the pie with the egg wash.
Place pie on a baking sheet lined with parchment paper into the oven and bake for 15 minutes. Then reduce the temperature to 350°F and continue to bake for 30 minutes until the crust is golden brown. Remove from oven and allow to cool completely before serving. Disclosure: *I received product in exchange for an honest review and all proceeds involving this campaign have been sent directly to the charity: Cookies for Kids’ Cancer.